ROBERT LEE -- S.V. Box, former Sweetwater High School principal, went to be with the Lord on Monday, Sept. 24, 2001 at the Robert Lee Care Center. S.V. was born on April 26, 1931 in Moro, Tex. He was the third of five sons of Robert Lee and Nellie Gray Box of Tuscola. He attended South Taylor Elementary School at Lawn and South Taylor High School in Tuscola where he was an outstanding athlete in all sports. He graduated from South Taylor in 1949. He attended Howard Payne College at Brownwood from 1949 to 1953 on a football scholarship. During his four years of college, he received many honors as a tackle on the Yellow Jacket Football team. He was named to the All-Texas Conference, Texas College Conference, and the Little All-American team. S.V. majored in physical education and secondary education with a minor in history. He received a master's degree from Hardin-Simmons University in 1964 with a major in Administrative Education and a minor in psychology. After graduating from college, he returned to his home town of Tuscola as head coach of the South Taylor Flying Tigers. On Dec. 22, 1955, he married Bobbie Davidson of Robert Lee. They moved to Sweetwater in 1956, where he was 9th grade football coach and assistant principal at Reagan Jr. High. 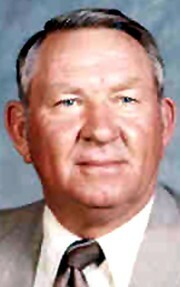 In 1958, he became the head line coach at Sweetwater High School and continued as assistant principal at the junior high. In 1966, he was named principal of John R. Lewis Elementary. During the 1970-1971 school year, he was assistant principal at Sweetwater High School and served as principal of Sweetwater High School from 1971 to 1974. In 1974, the family moved to Roscoe where he was superintendent of schools until 1981. At that time, he returned to Sweetwater school system as principal of Phillip Nolan Middle School and in 1986, he returned to Sweetwater High School as principal. S.V. and Bobbie both retired in June 1989 and moved to their ranch, west of Robert Lee. He remodeled the old ranch house and began a second career of ranching. He raised F1 cross cattle and Rambouillet sheep. In their retirement years, they enjoyed traveling. Their trips have taken them to all the major countries of Europe and to England, Australia, Hawaii, Greece, Turkey, the Bahamas and Alaska. They traveled to most of the states in the United States. He loved to hunt, fish, attend sporting events or watch them on television. His hobbies were gardening, building guns and training bird dogs. He was a member of the Pecan Baptist Church. He was a member of the Tuscola, Sweetwater and Roscoe Lions' Clubs and served as president of both Sweetwater and Roscoe Lions' Clubs. He was active in the community and a member of the Board of the Sweetwater Chamber of Commerce. During his time with the Sweetwater school system, he was a member of both the Nolan County Juvenile Board and the Library Board for many years. He served as a member of the Board of Secondary Principals, District XIV and while superintendent of schools at Roscoe, he represented the Small School Association as a board member. When his sons were in Little League, he was president of the Little League Association in Sweetwater. He taught Sunday School classes at First Baptist Church in Sweetwater. In 1981, the Roscoe Stock Show was dedicated to him for his outstanding work with the youth and the community. Mr. Box was a member of Texas State Teacher's Association, National Education Association, Elementary and High School Principal's Association and the Texas State Coaches Association. In 1958, he was a member of the Sweetwater coaching staff who coached as the South All-star Team in the annual North-South game. He was preceded in death by his parents, Robert and Nellie Box; a younger brother, Bobby; an infant daughter, Donna Nell; and his nephew, Kim Box of Keller. He is survived by his wife, Bobbie of the home; three sons, Blake of Robert Lee, Marcus and Pam Box of Roscoe and Powell and Joyce Box of Stratford, Okla. He had five grandchildren, who were the joy of his life, Brandon, Hannah and Kevin of Roscoe and Blaze and Rikki of Stratford, Okla.; three brothers, Troy of Arlington, Sammie and Jean of Arlington and Travis and Mary Lou of Abilene. A memorial service was held at 2 p.m. on Wednesday, Sept. 26, 2001 at the Robert Lee Baptist Church. Graveside services followed at the Paint Creek Cemetery, west of Robert Lee. Brother Blake Westbrook, pastor of Lake Meredith Baptist Church at Fritch, Tex. and Brother Dale Patterson, of Pecan Baptist Church conducted the services. Brother Blake, a former Roscoe student, is thought of as one of their family. Arrangements were by Shaffer Funeral Home at Robert Lee. Pallbearers were Drennon Daves, Melvin Robertson, Jerry Don Stockton, Truitt Mobley, Alton Fields, Bobby McMillian, Tommy Lancaster and Arliss Willingham. Honorary pallbearers were Tom Ritchey, David Welch, Patrick Gerald, Archie Hunter, Al Lankford, David Reddel and Bill Hunter.